A monument commemorates the 80th Anniversary of the formation of QANTAS (The Queensland and Northern Territory Aerial Service Ltd). QANTAS was formed by three men, Lieutenant Hudson Fysh, Mr Fergus McMaster, and Lieutenant Paul McGinness in 1920 with a view to providing aerial services to central Queensland. Financial backing came from wealthy Queensland pastoralists. On the 23rd February, 1921, Winton Shire resolved " to make a grant to QANTAS Ltd. of half the amount expended in making a landing ground for aeroplanes up to 20 Pounds." 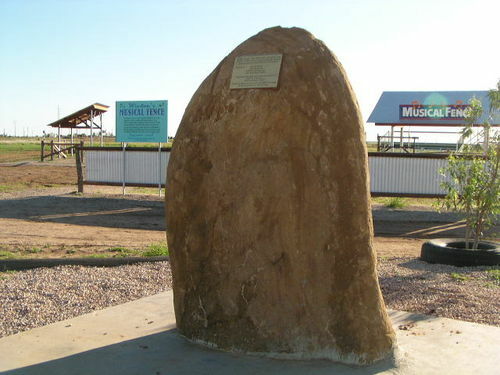 Unveiled by James Strong Chief Executive QANTAS AIrways Ltd.
Erected by Winton Shire Council and QANTAS Airways Limited and Winton's WORC Crew.